MINSK – The Belarus tax for unemployed individuals will not be collected this year, although the tax has not actually been dropped or suspended. On March 9th the President of Belarus Alexander Lukashenko announced that in 2017 the government would freeze collection of the “social parasite” tax. 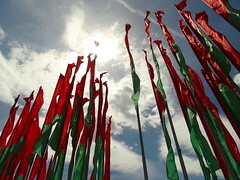 The tax, which was adopted in 2015, is required to be paid by any individual taxpayer in Belarus who works less than 183 days in any given year. The rate of the tax is set at a rate equivalent to approximately USD 250 per year. Originally the tax was set up in order to compensate the government for the tax revenue losses suffered due to taxpayers’ unemployment. ROME – Greece needs to cut its pension spending, while also spreading personal tax obligations across more people, according to the IMF. On February 7th the International Monetary Fund released its latest report on the state of the economy of Greece, suggesting that a number of new tax reforms are needed in order for the country to become economically sustainable. One of the ley reforms described in the report is a broadening of the personal tax system, in order to make the system more equitable. It was explained that by spreading the tax burden across more taxpayers, the rates levied on personal incomes could be lowered, and the extra tax revenues could be used to cover government expenditure. SEOUL – Efforts by the government of South Korea to boost the national birthrate through tax breaks have led to a growing divide between the taxes paid by families and single people. Tax benefits available to couples with children in South Korea have effectively increased the disparity between taxes paid by families and single taxpayers in the country, according to the results of new research released in the journal of the Korea Academic Society of Taxation. South Korea has several tax breaks available for families with children, with the breaks being cumulative for more than one child. WASHINGTON D.C. – In 2015 the IRS focussed its audits on individuals with incomes of more than USd 10 million and on individuals claiming to have no income at all. Over the course of 2015 1 228 117 individual income tax returns were audited by the US Internal Revenue Service, according to a statement issued on March 31st by the US think tank the Tax Foundation. Approximately 0.8 percent of all filers were audited during 2015, a rate equivalent to an estimated 1 in every 120 households in the country. The Tax Foundation found that taxpayers were more likely to be audited if they had high levels of income or, conversely, reported no income. JERUSALEM – Fifty high-level executives of banks and financial institutions in Israel will soon face salary cuts, as new tax rules are brought in to cap excessive pay packets. Earlier this week the parliament of Israel approved tax changes aimed at capping the salaries of high-level executives at a maximum of ILS 2.5 million (approx. USD 657 thousand) in order to reign in income inequality. Any salary payments of over ILS 2.5 million per year paid by a bank or financial institution will no longer be deductible when calculating corporate income tax obligations of the business.